In 2001, the da Vinci Surgical System (Intuitive Surgical, Inc., Sunnyvale, CA) was approved for use in urology (www.fda.gov) and the technological improvements have translated to a paradigm shift, especially in the field of urologic oncology. Robotic-assisted laparoscopic prostatectomy (RALP) has quickly become the minimally invasive surgical procedure of choice at most centers of excellence and robotic-assisted laparoscopic radical and partial nephrectomy (RALPN/RALN) and cystectomy (RALC) are also increasing in numbers. The impetus for the robotic approach to surgical management is based on a combined need for minimally invasive treatment with optimal surgical outcomes. Historically, conventional laparoscopy has been at the forefront of minimally invasive surgical technique and the fundamental principles of robotic surgery are founded upon those used in laparoscopic surgery. However, the advanced technology utilized in robotics has required modifications of these techniques to capitalize on the enhanced capabilities of robotic surgery. Whereas laparoscopic surgery is limited by counterintuitive movement, 2D visualization, and a decreased range of motion, robotic surgery offers 3D visualization, seven degrees of freedom, and is a natural reflection of the surgeon’s movement. Robotic surgery therefore offers enhanced capabilities for visualization, surgical dexterity, and exposure to the surgical field but these are ultimately dependent on the proper placement of the ports used for access. 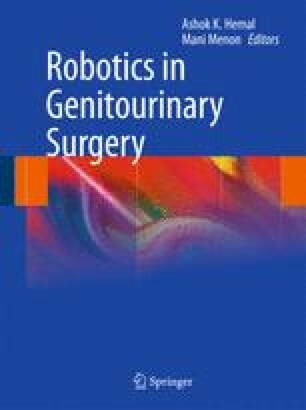 This chapter will provide a comprehensive overview of the standard techniques for access and port placement in a number of major robotic urologic procedures focusing on the nuances of prostate, renal, bladder, and female robotic urologic surgery.